Pagosa Springs, CO -- We know that spring doesn't technically arrive until March 21, but the feeling of spring is definitely in the air and the promising signs are all around (yeah, yeah, pipe down Powderhounds). 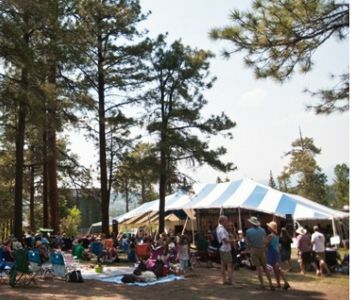 And in just a little over 3 months, it will be time for the Pagosa Bluegrass Jam Camp, Pagosa Bluegrass Camp for Kids and the 5th Annual Pagosa Folk 'N Bluegrass. This year's lineup is one you won't want to miss. These artists are already booked and ready to perform for the audience...Mountain Heart, Jimmy LaFave, Sierra Hull & Hwy 111, Bearfoot, The Deadly Gentlemen, Elephant Revival, Lake Street Dive, SHEL, Phoebe Hunt Project, Finnders & Youngberg, Cahalen Morrison & Eli West, Jayme Stone, and more to be announced later. You can still take advantage of early bird pricing through March 31 -- $10 off single day and $20 off multi-day gate price. Pagosa Folk 'N Bluegrass has been expanded to a 3-day festival this year, with music on the main stage starting at 5 PM on Friday, June 8 and continuing into the night. The campground will open Friday morning at 11:00 AM, and there will be an array of workshops on the hill beginning at 1:00 PM, so there's no excuse not to make it a 3-day weekend. Participants in our bluegrass camps get to stay in the campground through the festival - no waiting for the land rush (just in case the appeal of personalized instruction, pickin' with your peers and having Reservoir Hill practically to yourself for three whole days wasn't enough incentive to enroll).